The Demilitarized Zone (DMZ) between South-North Korea has served as a sanctuary to diverse biological resources since the Korean War ceased in 1953. During winter season, flocks of cranes (Grus spp.) converge in the rice field along the DMZ. All other refuges for cranes that winter in South Korea were destroyed, due mainly to wilful industrial expansion in the past few decades. The presence of cranes in this region is attributed to the rasidual rice grains left behind by harvesters. This winter habitat is, however, very fragile, for a number of reasons. First, the local farmers regard the cranes as a potential threat in their livelihood rather than as an ecological member sharing the same ecosystem resources. Second, exercising property rights, the landholders have actively advocated an industrial development program. Third, it is difficult to legally impose the notion of wildlife preservation even if there is a perception among the general public that the crane is worth preserving. This study sought to formulate a policy measure to guide the local egalitarian farm economy to ecological economy in which farmers and cranes are the harmonized co-users of the ecosystem resources. Valuation based approach is employed in our study to show that biodiversity is not in conflict with local economic well-being but, in fact, essential to it. When the three-year Korean War ceased in 1953, the United Nations Military Armistice Commision established the Demilitarized Zone (DMZ) and the Civilian Control Zone (CCZ) along the South-North Korea divide. The military nature of these zones has served to strictly limit access, thereby affording the ecological resources almost complete protection. For example, the DMZ, a 4-km wide and 250-km long corridor crossing the Korean peninsula at around 38 degree north latitude has served as sanctuary to wild-animals and plants for almost one half century since fighting ceased. The CCZ, 5- to 20-km wide farm and forest lands with a few inhabited residential and commerce areas, functions as a buffer zone for the sanctuary bio-reserves in the DMZ (John, 1998). Wildlife found winter refuge in this transfrontier natural reserve. Of special significance are the endangered red-crowned (Grus japonensis) and white-napped (Grus vipio) cranes (red-crowned,, and cranes) that spend winter in this area. Especially the red-crowned cranes need the complete protection for night-time roosting, as provided by the DMZ's de facto sanctuary. The total population of the endangered species of red-crowned cranes in the world is about 1,500, of which 250 to 300 birds spend winter in the Choelwon valley, the central part of the DMZ. All other winter habitats for cranes in South Korea have been lost due mainly to wilful industrial expansion in the past few decades. Cranes have been attracted to this valley for nearly 50 years, soley due to the protection from disturbance afforded by the DMZ, and the residual rice grains that remain after harvesting the farm fields in the CCZ. This winter habitat is, however, very fragile, for several reasons. First, the local farmers regard the cranes as a potential threat in their livelihood rather than as an ecological member sharing the same ecosystem resources. Second, exercising property rights, the landholders have actively promoted a development program. Third, it is difficult to impose legally the notion of wildlife preservation even if there is a perception among general public that the crane is worth preserving. Fourth, there is no organized public commitment to encounter the persistent threat of development. For example, the UNDP (United Nations Development Program) and a local Land Development Corporation have been jointly involved in a study of development program, in which the value of preserving ecological resources is not even attempted to be estimated. This is a prime example of information void, i.e., no criterion by which we are able to understand what we lose or gain. In our paper we present estimates of the nonmarket benefits of keeping the ecological resources from development in the transfrontier area. Ecological resources have unpriced values (Sinden, 1984). The benefits of preserving the resources are perceived but are not transacted in the market where price is determined as a signal for distribution. The absence of price for the valuable resources is the major reason for lacking a relevant resource use policy. Therefore, the fate of the biological resource is in the hands of the local landholders who are interested in development and ignor non-market values contained in the ecological resources. Omitting these non-market values from B/C analysis of development leads to underestimating the significance of loss of natural assets. We show how estimated nonmarket benefits canl be used as for a policy information to resolve the conflicting economic interests between farmers and wildlife. The total benefits of the ecological resources that we are concerned with consists of two parts: first, the eco-tourism use value of the resources as perceived by the tourists; second, the preservation value of eco-resources perceived by non-using individuals in the nation. The objective of our study is to estimate these values of ecological resources which, once analyzed can facilitate the transition from the local egalitarian farm economy to biodiversified ecological economy in which farmers and cranes are the harmonized co-users of the ecosystem resources. The study will provide (1) a useful policy tool for the concerned government agencies and the local community that biodiversity is not in conflict with local economic well-being but in fact essential to it, and (2) new valuation techniques which Korean scholars can use to investigate the similar problems in the future. The target goods to be valued are the farm and forestry ecological resources (FFER) in the Choelwon CCZ area which embraces the wildlife habitat and old battle-field ruins. The satisfaction of sightseeing perceived by the tourists are the essence of use value. Since the study site is in the Army controlled transfrontier areas, all tourists must enter and exit through military police checkpoints. The war-monument and old battle field ruins in the Choelwon CCZ attracts over 360,000 tourists per year. This tourism provides the regional economy with tangible economic effects of related business opportunities, including hotels and restaurants, which create macro-economic multiplier effects in the regional economy. At the military inspection post, the holiday mood of sightseers is suddenly suppressed. Encountering the heavily armed military police checking their tour buses and luggage, the tourists become tense and subdued. However, this apprehension does not last very long. Immediately after passing through the military inspection post, they face farm and forestry landscape that is in sharp contrast to the urban environment where they live or have seen enroute to the CCZ. They soon relax upon seeing a peaceful pastoral valley of rice paddies and small, forested hills amidst flowing streams and springs. Only the presence of battlefield monuments and some ruins evidence the past wartime violence. However, what the tourists expect to see in the Choelwon area is not the landscape of the farm and forestry ecological resources (FFER) but war monuments and old battle fields. Actually, "Battle-Field Monument tour" is the official name of the sightseeing package for the Choelwon CCZ area. The major attraction point for tourists is, among others, the under-ground tunnel installed by the North Korean Army for the purpose of an abrupt attack to the South. The landscape of farm and forestry ecological resources is also enjoyed by the tourists, but not as the primary sightseeing attraction. The FFER and the Battle-Field Monument (BFM) constitute a unique commodity relation in the consumer demand theory. Using economics jargon, the subsidiary relation of the FFER to the BFM is weak complementary in demand (Mäler, 1974). The economic characteristics of weak complementary is that quality of ecological resources does not affect the level of tourists' utility unless sight-seeing of the "Battle-Field Monument" is bought by the tourists. Readers are advised to understand this unique complementary role of the FFER with BFM tourists attraction in this transfrontier areas where the spectacular landscape of the FFER is not used for sightseeing unless the BFM is not marketed to tourists. Nevertheless, this complementary relation enables us to measure the benefits of FFER using the demand information for the BFM. Thus, a particular consideration needs to be given in approaching the modeling framework of the consumer preference behavior and the FFER in relation to the BFM. The mission of our research in Korea where nonmarket valuation is new, is to provide an example of the pursuit of using a variety of microeconomic, utility-theoretic characterizations of individual preferences with respect to ecological resources. In the next section, we show a theoretical definition of the use value of the FFER in complementary relation to the BFM sightseeing. x = x(p, m, q). v=v(p, m, q). By inverting the indirect utility on m, the preference behavior is expressed as dual cost minimization, i.e., visitors' efforts to minimize expenditures subject to the constraint that utility is held constant to the reference utility level, û (Varian, 1984; John, et al. 1992). where e( ) is the expenditure function of a visitor, pi is the cost for visiting the BFM including entrance fee, and û is the reference utility level, or the satisfaction level of seeing the landscape of the FFER and BFM . where UV is use value, p*=(p1*, p2,...,pn), p = (p1, p2,...,pn), and p1* p1. Use value is the amount money that the visitor would be willing to pay to avoid a decrease in the quality, q, holding utility constant at û.
Theoretically, it is compensating variation: the maximum lump sum of money that an individual would be willing to pay to keep the current level of the FFER quality, q. In this study, the contingent valuation methods (CVM) is used to assess individual preferences for the cranes and to estimate the use values of the FFER in the Choelwon area. Travel cost method (TCM) is not appropriate to this study for various reasons. First, as explained previously, the FFER is not the target for trip destination but only complementary to BFM. Second, because travelers are joined in a big group organized by a travel agency and moving in big tour buses, they do not know the exact amount of travel costs they spend or even the entrance fee. Therefore, the TCM is not practically applicable to the non-market valuation of the FFER. Among the various CVM, double-bounded dichotomous is the most advanced procedure used widely for nonmarket valuation in the western countries. Single and/or double dichotomous methods are advanced in terms of inducing the individual to elicit value in a real market-like situation which avoids respondent's strategic behavior and stress on value elicitation (Hanemann, 1984, 1991). However, bidding game is the appropriate procedure for this study, of which one of the purposes is to provide the concerned government agency with policy making information. What we need to know is not the individual's response rate of "YES" or "NO" to the offered value but rather to know their socio-economic characteristics that make them interested in keeping the current status of the FFER and WTP (willingness to pay) not to forego the opportunity of seeing the FFER in the Choelwon area. Therefore, in this study for valuation of the use value of the FFER, the traditional bidding game was used to measure the individual perceived value (Cameron, 1988; Ready, 1996). Because the area is under strict military control, tourists are restricted to a specific place within a limited time. Accordingly, a short and tersely designed questionnaire was used. The entrance fee was used as the payment vehicle. The entrance fee varies among the tourists depending on tourist age and the size of group. Thus, the use value in equation (2) means that, at the individually determined use value, the visitor is indifferent between paying the use value in the form of higher entrance fees and taking a trip, versus not taking trips and leaving income intact. The CVM questionnaire survey was performed in the fall of 1997 (John, 1997). The bidding game procedure is outlined below. In order to keep the current pleasant landscape view of the FFER you just have enjoyed, we need to control land conversion. Would you be willing to pay X amount of entrance fee, in addition to the current rate, to raise funds to compensate land-owners for not converting farm or forestry lands to commercial sites? The stated preference data of WTP is collected from the tourists at the site. Therefore, the sample is not random but truncated with the capable visitors only (Ziemer and Hill, 1982). Another concern is that the bidding was proceed within a wide payment interval, 500 to 1000won (about 1,250won is US$1.00), which cause a well known problem of count data in econometric estimation (Cameron and Trivedi, 1986). Thus, the CVM valuation model is estimated with maximumlikelihood method using poisson distribution on the truncated sample. The dependent variable of the estimated CVM equation is WTP; the average is 2,842won. The sample size of the model is 111 tourists who indicated their preference for the present FFER landscape over the developed. Table 1 shows definitions and means of variable and Table 2 the estimated equation. 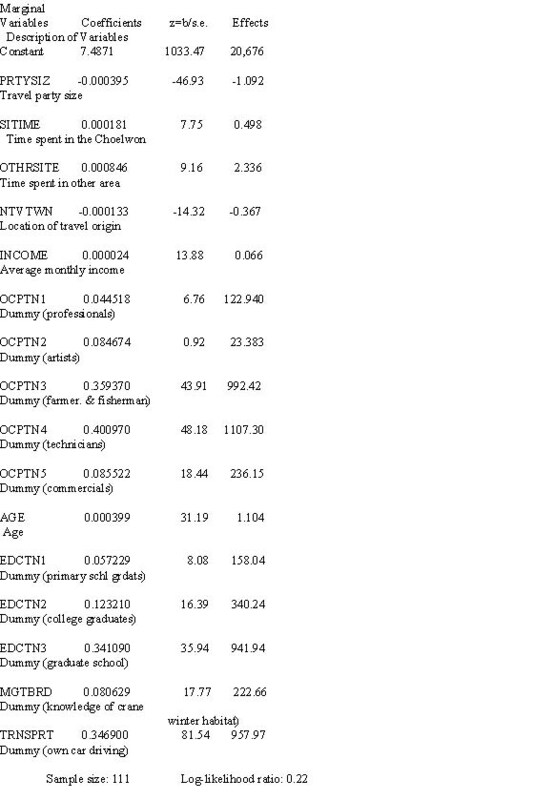 Signs of the coefficients are as expected. The sample represents the general socio-economic profiles with average 45 years of age and 1,540,000won of household income per month. The level of education of the sample is: middle and high school graduate are 40.2%, junior college and university graduate 39.3%. Of the respondents 11.6% are engaged in professional jobs, 5.32% agriculture, commercial business and salaried 28.7%. The likelihood ratio of estimated equation is 0.22 which means the model is robust. Also, The z-statistics, shown in the third column of Table 2 are much greater than 2.0, which indicate that the independent variables are highly significant in explaining the relation to the dependent variables. To illustrate the strength of the relationships between dependent and independent variables, the partial derivatives at mean values of the explanatory variables are shown in the fourth column. The WTP of the respondents with education level of graduate school or above (EDCTN3) is 942won higher than others. The respondents who knew that there is crane wintering habitat in the Choelwon area ( MGTBRD) showed a much stronger preference (223won more) for keeping the current status of the FFER than those who did not know. Family unit travelers in own-automobile (TRNSPRT) is willing to pay 958won more than the group travelers with tour-bus. The positive coefficient for income (INCOME) indicates that the FFER is normal good. The respondent's age (AGE) shows the same positive relationship as income. Nevertheless, the marginal effects of age are greater than that of income. This means that age which represents the capacity of individual experience and information, contributes more to interest in keeping the quality of the ecological resources. By the same token, the level of education, which is another information capacity indicator, explains that the higher the level of education (EDCTN1, 2, 3), the higher WTP is for keeping the present quality of FFER. These results stress the importance of formal and/or informal education for positively effecting interest in environmental quality. According to the annual statistic book of the Choelwon local government, the average number of the visitors to the Choelwon area is 369,500 per year. Assuming that the total number of visitors in 1997 is the same as the annual average and also 84.1% of them show preference for keeping the current status of the FFER, the total use value of the ecological resources is 1.05 billion won (US$840,000). The estimated use value is 2.7 times greater than the average annual revenue of the entrance fee. Use value of ecological resources represents only a part of the total benefits of the FFER. In addition, preserving the FFER embraces non-use values perceived by existence, option, and bequest preferences. Existence value is the willingness to pay for the satisfaction of knowing that natural environment is protected. Option value is defined as the annual payment of a kind of insurance premium to retain the option of possible future use. Bequest value is defined as the willingness to pay for the satisfaction derived from endowing future generations with irreversible biological resources (Brookshire,et al. 1983; Loomis, 1988; Walsh, et al. 1984). In July of 1998, the non-use value of preserving the ecological resources of the DMZ and CCZ was surveyed. To simplify presentation, only the estimation result is introduced here. The tax is used as the payment vehicle for the CVM to measure non-use value, i.e., WTP of additional tax to preserve the FFER as it is. The total use plus non-use values of the FFER in the Choelwon is about 23billion won (US$18.4million) per year. If we extrapolate the use value to the next 50 years using 12% interest rate, the present value of the benefits for keeping the current status of the FFER is approximately 191billion won (US$152.8million). The CVM is a widely used nonmarket valuation method in developed countries but still a new research protocol in Korea, which is in a state of transition toward being a developed country. However, the valuation method elicited remarkable results: First, it spported the idea that the study framework using the CVM fits well to estimating values of ecological resources in Korea. Second, as the bequest non-use value implies, keeping ecological resources is expressly desired not only for the individuals' current satisfaction but also for the well-being of their next generation. While ecological preservation may constitute the financial impetus for farmers to practice environmentally safe farming, the estimated total benefits would seem to justify government compensation of land-holders for not converting land to commercial sites. Meanwhile, the multiplier effects generated by eco-tourism related business activities will permeate through the regional economy, which will eventually sustain itself in harmony with a healthy regional ecosystem. This nonmarket valuation study performed in the Choelwon area represents only a preliminary example of the kind of bio-reserve valuation and new decision making procedure in Korea with which policy makers are unfamiliar. The difficulty in changing landholder's behavior is that the rewards of a bio-reserve program are, although lucrative in the long-run, might be negligible compared to the more immediate attractive profit potential of resource-consuming development projects. This is compouned by the fact that adverse environmental impacts are not included in feasibility accounting, and in fact are not recognized at all until the adverse effects become a debatable issue among the general public. The primary threat of the cranes habitat extinction comes not from public inaction but from wilful action by private landowners. We feel the most efficient pragmatic solution is a rational and tangible compensation scheme that can convince landowners and other private interests that their economic ends are best served in the long-run by resource conserving actions rather than resource destroying one. In this way, powerful and wilful forces in the region will naturally, out of their own self-interest, work to preserve the rich and unique ecosystem of the Korean Demilitarized Zone. I extend my thanks to Mr. Curtis H. Halvorson for editing and helpful critiques and to the SNU students for surveying data. 1. Brookshire, D. S., L. S. Eubanks, and A. Randall, 1983. Estimating Option Prices and Existence Values for Wildlife Resources. Land Economics, 59: 1-15. 3. Cameron, T.A., 1988. A New Paradigm for Valuing Non-market Goods Using Referendum Data: Maximum Likelihood Estimation by Censored Logistic Regression. Journal of Environmental Economics and Management, 15: 355-379. 4. Hanemann, W.M., 1984. Welfare Evaluation in Contingent Valuation Experiments with Discrete Responses. Amer. J. Agr. Econom., 66: 332-341. 5. Hanemann, W.M., J. Loomis, and B. Kanninen, 1991. Statistical Efficiency of Double- Bounded Dichotomous Choice Contingent Valuation. Amer. J. Agr. Econom., 73: 1255- 1262. 6. John, K. H., R. G. Walsh, and C. G. Moore, 1992. Comparison of Alternative Nonmarket Valuation Methods for an Economic Assessment of a Public Program. Ecological Economics, 5: 179-196. 7. John, K. H., 1998. The Korean DMZ: A Fragile Ecosystem. Science, 280: 808-809. 8. John, K. H., 1997. An Economic Evaluation of Ecosystem Preservation of Chulwon Area, In The Survey of Forestry Ecology in the DMZ and the Adjacent Areas (In Korean), The Ministry of Agriculture and Forest, Forest Research Institute, p.3- 17. 9. Loomis, J., 1988. Broadening the Concept and Measurement of Existence Value. Northeast Journal of Agr. Res. Econom. 88: 23-29. 10. Mäler, K.G., 1974. Environmental Economics: A Theoretical Inquiry. Published for Resources for the Future. Johns Hopkins University Press, Baltimore, 267pp. 11. Ready, R.C., J.C.Buzdy, and D.Hu, 1996. Differences Between Continuous and Discrete Contingent Value Estimates. Land Economics, 72: 397-411. 12. Sinden, J.A. and A.C.Worrell, 1984. Unpriced Values: Decision Without the Market Place. John Wiley & Sons, New York. 13. Varian, H. R., 1984. Microeconomic Analysis, 2nd ed. New York, W. Norton & Company. 14. Walsh, R. G., J. B. Loomis, R. A. Gillman, 1984. Valuing Option, Existence, and Bequest Demands for Wilderness, Land Economics, 60: 14-29.